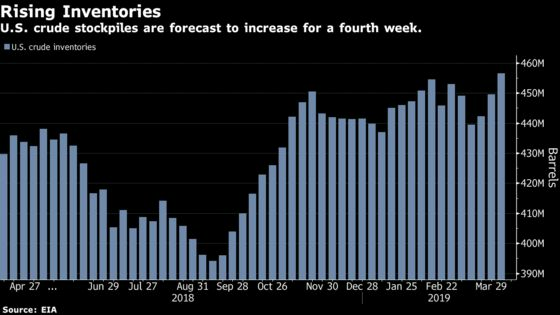 (Bloomberg) -- Oil extended its gains after an industry report was said to find an unexpected drop in U.S. inventories last week, bolstering the picture of a tightening crude market. Futures in New York gained as much as 1.5 percent in after-hours trading on Tuesday, after the American Petroleum Institute reportedly showed a 3.1 million barrel decline in American stockpiles. If confirmed by official government data due on Wednesday, that would defy analyst forecasts of rising supplies. Oil has rallied around 40 percent this year as the Organization of Petroleum Exporting Countries and allied producers including Russia cut output. While involuntary losses in Iran, Venezuela and Libya have further restricted supply, record U.S. shale-oil production and signs of increased drilling activity are complicating OPEC’s efforts to re-balance the market. West Texas Intermediate for May delivery rose 94 cents to $64.34 a barrel on the New York Mercantile Exchange at 4:53 p.m. The contract had reached $64.05 at the official close of trading earlier in the day. Brent for June settlement added 72 cents to $71.90, after closing at $71.72 a barrel on the London-based ICE Futures Europe exchange. API also reportedly found a 3.56 million barrel decline for gasoline stocks last week, suggesting steady fuel demand. The drop in crude inventories compared to a 2.3 million-barrel increase predicted by the median estimate of analysts surveyed by Bloomberg. The Energy Information Administration is due to release the official tally tomorrow. Gasoline rose 1.3 percent to close at $2.0383 a gallon. Russia reduced oil output to 11.25 million barrels a day at the beginning of April, Interfax reported, citing an unidentified person with the knowledge of industry data.